Brazilian police say they have identified a FIFA official who they believe could be at the center of a ticket-tout scandal worth $100 million. Eleven suspects have been arrested after their mobile phones were tapped as part of the investigation. The suspected ticket touts were apprehended earlier in the week by officers who were also able to identify the first name of the FIFA official from telephone calls, according to Reuters. A Rio de Janeiro police investigator, Fabio Barucke, who is in charge of the case says that the FIFA suspect would have clearance to enter FIFA offices, stadiums and other administrative areas, where he or she would have access to game tickets. Barucke also added that the suspect is not Brazilian and is only in the South American country because of the World Cup. Some tickets have been resold for eight times their face value, the investigator said. The Associated Press reported that the suspected ringleader has been named as Mohamadou Lamine Fofana, an Algerian man who was previously staying at the Copacabana Palace hotel, where all the top FIFA executives are staying. Barucke believes Fofana was the middleman and that the ticket source was "someone higher up" the chain. "[Fofana] has tickets from hospitality, from MATCH, and he was close friends with someone from FIFA who was in the middle of that negotiation – who was helping out with that negotiation,” Barucke added. “We were able to identify there is the participation of someone from FIFA." MATCH Hospitality is the exclusive rights holder to provide tickets for FIFA tournaments and has been officially authorized by football’s governing body. Tickets and hospitality packages can be ordered online, or through its appointed sales agents. A spokeswoman for FIFA said Thursday that football’s governing body has not yet received any information from the police about the potential suspect. Delia Fischer, the spokeswomen, added that given the number of third party companies and contractors that operate in and around the World Cup, the person may not even be employed by FIFA. "Maybe it's not from FIFA," Fischer told reporters. "It's often easy to come to a conclusion about who is FIFA." 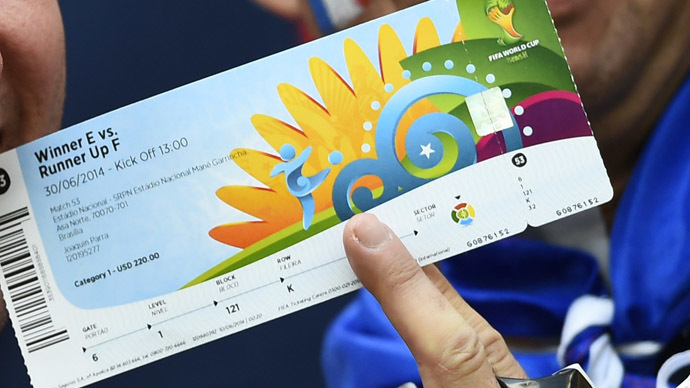 If proven, this will not be the first time FIFA has faced criticism concerning World Cup tickets being sold on the black market at exorbitant prices. In 2006, the disgraced former president of CONCACAF, which is the association for Central American and Caribbean football, Jack Warner, made vast sums of money from selling tickets on the black market. He used his connections within his native Trinidad and Tobago, who had qualified for the World Cup for the first time in their history, to get his hands on their entire allocation of tickets for the tournament in Germany. Through various tourism companies he owned, he resold these tickets at vastly inflated prices, which broke FIFA rules.